As an independent planning office, we provide comprehensive service and support for energy suppliers, investors and municipalities. We plan and supervise integrated construction projects in the fields of process engineering fermentation systems, co-generation (CHP), heating networks and gas feeding. Whether it is new buildings or repowering existing plants: our primary focus is on the design of a tailor-made, efficient and economical system solution. In this respect, all factors such as location, substrate, licensing situation, infrastructure and economy are taken into account and interwoven into an individual concept in the light of current technical possibilities. We attach great importance to a timely, cost-efficient and quality-assured implementation. Let us convince you of our know-how and comprehensive range of services from technical consulting, feasibility studies, direct planning services, due diligence, and project management to general planning. All planning and implementation processes are carried out independently from any influence by corporate interests or product suppliers. 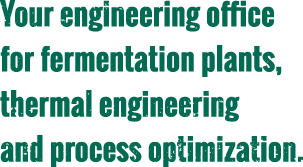 The special process-engineering requirements of the planning task and their economic goals are the focus of our attention on project implementation. A reliable problem analysis, specialist advice, consistent schedule planning, and transparent cost management are at the centre of our service portfolio.